Traffic on Ocean Blvd. in Downtown Long Beach. Animation by Brian Addison. “California—at the state, regional and local level—has not yet gone far enough in making the systemic and structural changes to how we build and invest in communities that are needed to meet state climate goals,” the executive summary read in part. 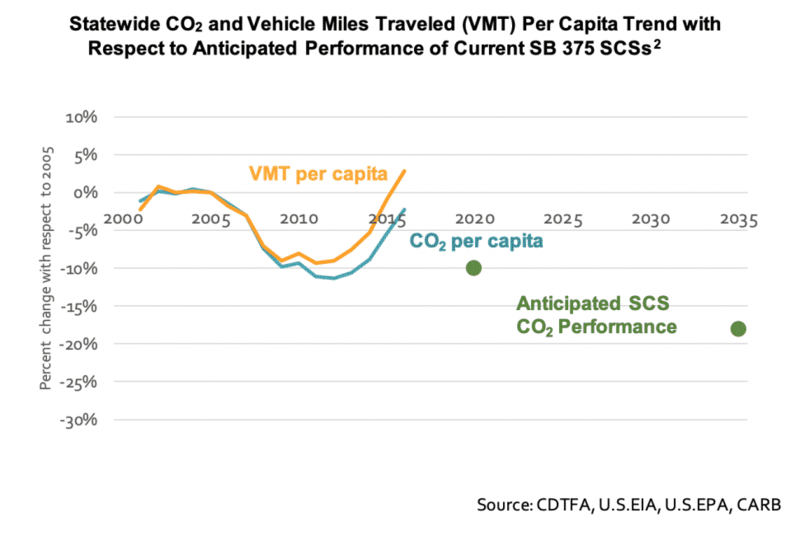 And while overall emissions have dropped to levels unseen before the ’90s, a situation lauded by politicians after we met our 2020 goals early, something else was not mentioned: Non-commercial vehicles accounted for 28 percent of all carbon emissions, by far the state’s single largest contributor. History in context is key to understanding the scope of the problem at hand. Those 2020 goals were launched at a time when legislators passed an aggressive suite of bills seeking to reduce carbon emissions. The 1990s produced scientifically backed data showing pollution was altering the climate and threatening the livability of the planet. While much has been said about making cars cleaner and more efficient, very little has been said about why people drive so much or for such great distances on such a regular basis. With a severe housing decrease in the foreseeable future—particularly affordable housing in transit-rich areas—those displaced from urban centers have become much more likely to buy a vehicle to get to and from work. This, in turn, has brought a second wave of aggressive legislation that focuses on creating housing near transit, what is called transit-oriented housing, in order to meet a new slew of climate change goals. The state has pledged to reduce its greenhouse gas emissions to 40 percent below 1990 levels by 2030. In addition, over the past decade, it created a first-of-its-kind law such as SB 375, the Sustainable Communities and Climate Protection Act of 2008. And those lofty goals for 2030? You can pretty much book it that they will not be met the same way the 2020 goals were. Why? Because the 2020 goals mainly dealt with improvements to the electrical grid and commercial freight transit. The 2030 guidelines deal with the great white whale of California emissions: The private automobile. The report notes that transit ridership has gone down. In an analysis over the last year, for every 100 car-owning households that moved out of a high-quality transit area, only 95 moved in—and that those who moved out were likely to purchase more vehicles while adding 75 million additional miles in subsequent years than those that moved into transit areas. In turn, those that had moved into high-quality transit areas used transit more. So how did ridership decrease? Displacement could be the culprit: Lower-income households are using cars more because they are getting displaced out of not just their homes, but access to transit. “While these findings are preliminary and reflect just one year, they add to a body of research that has found that displacement may be occurring near transit, that lower-income households are commuting longer distances possibly due to a shortfall in affordable housing construction, and that falling public transit ridership may partially stem from displacement,” the report read. Ultimately, we are faced with two very dire realities. Fully ambulatory Californians will have to walk, bike, and use mass transit much more. Much, much more. Climate experts say able-bodied Californians will have to walk by foot four times as much as they do now, and will have to bike nine times as much. In other words, the report is adamant that a reduction in the growth of single-occupancy vehicle travel is essential if we are to achieve an emission level that is 40 percent below those of 1990, by 2030. Tack onto this Gov. Jerry Brown’s new carbon neutrality goal, which the state hopes to achieve by 2045, and the habits of residents who use their car for everything becomes paramount. This is not just about long, daily commutes to work, the type of trip perceived as “essential,” since 46 percent of all passenger car trips are under 3 miles. And it’s not about gas versus electric vehicles since, according to the report, even if zero-emission car sales increased tenfold, the state would still have to reduce the miles traveled by cars by 25 percent in order to meet the 2030 goal. Shortly before this report was released, the California Air Resources Board and the California Transportation Commission, which have existed more than 50 and 40 years respectively, met for the first time in a historic meeting, echoing the disconnect between powers in the state that control climate and transportation policies. Mending that disconnect is one of the report’s silver linings: Cooperation and collaboration will be key if we are even attempting to achieve our climate goals, with the recommendation going as far to say that the state should create a new inter-agency group made up of state, regional, and local officials to home in on how to connect these moving parts toward success. But let’s be frank here, folks: no inter-agency group will be able to unilaterally alter our culture. They may help or influence, but they will not magically turn around our very self-centric habits that revolve around comfort, ease and an eight-speaker sound system. The man at the conference was not just reasonable in his question, he was right: culture cannot be legislated. But I can guarantee you that when your livelihood is threatened not because of a law but because you can’t get from Point A to Point B, maybe then—when it’s way too late, when the cost of driving is way beyond your means—you will have wished we put in that mass transit lane on the 710 expansion instead of adding another car lane.